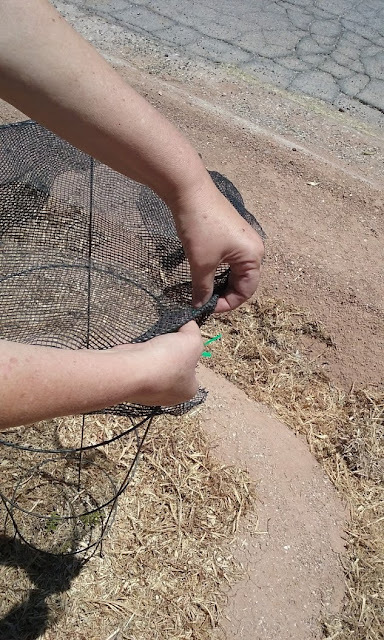 Sustainable Living Tucson: Heat wave! When Summer began, I adapted to the hotter weather by watering the younger plants in our food forest twice a day - once in the morning usually before it got hot and again when it cooled off in the evening. 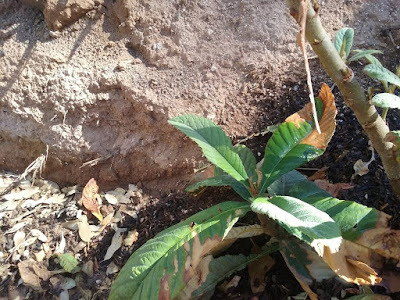 On days when they were irrigated with greywater from our washing machine, I still moistened the mulch around my heritage fig trees, curry plants and my not-so-drought tolerant loquat tree. Note: This is a learning experience for me. I've been told that deep watering once or twice a week is the ticket with loquats. (See comment below.) Dan has some five gallon buckets with holes drilled in the bottom that we can use. 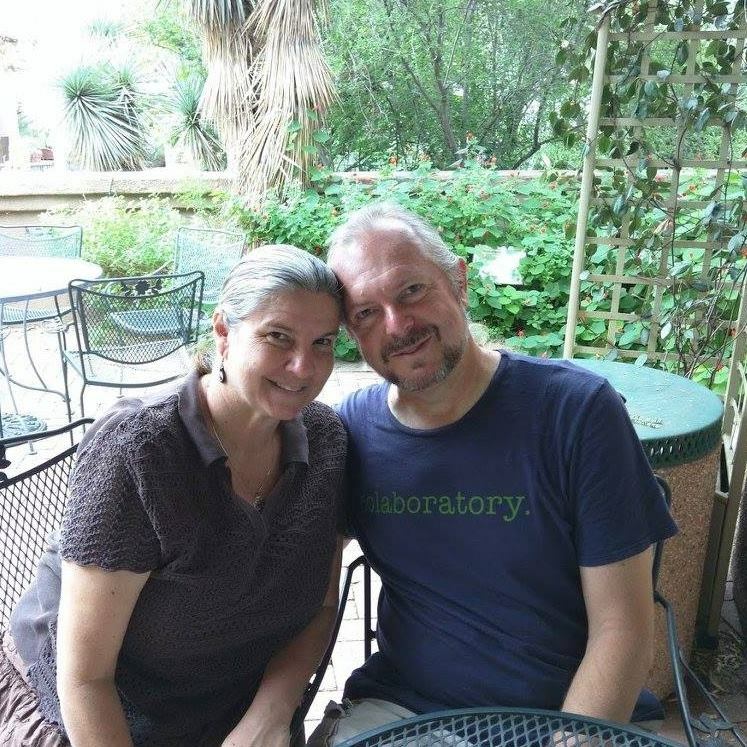 Sometimes I would get so caught up posting in Desktop Activist Tucson that I wouldn't get to it until 9 a.m. or even 10. My bad... But the monsoon rains would save the day! But then the monsoon rains went away and it reached 109 degrees yesterday! This morning I read in ARIZONA DAILY STAR, "Be prepared: 3-day excessive heat warning for Tucson area." "Today is expected to be the hottest of the three-day excessive heat warning for the Tucson area, but a little relief could come this weekend, the National Weather Service says in its forecast [...] Today's high could reach 112 degrees. The record high for the date is 109 [...] in 1987. Tucson has only hit highs above 110 degrees for more than two consecutive July days four times since 1895, the weather service says." YIKES! No more dilly-dallying for me! This morning I got outside by 6:30 a.m. and gave my plants two cans of water instead of one. I remembered how my baby moringas made it through the hot summer with the help of a little shade. I still had the tomato supports and shade cloth, so I constructed a shade contraption over the already scorched loquat tree and the curry plants. 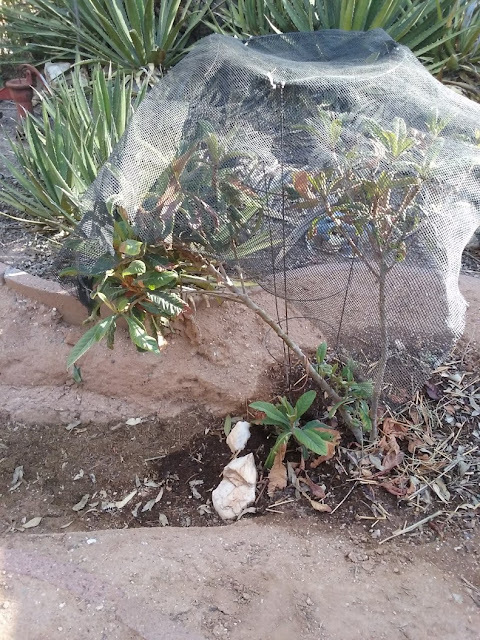 I have been pulling the shade cloth off so the loquat gets some morning sun. I cover it up again when the ground is so hot it burns my bare feet. 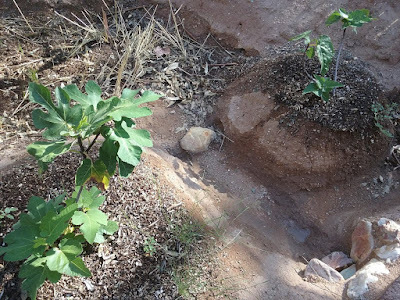 The heritage fig trees by the greywater basin were looking good, so I decided to see how they would fare with intermittent shade from our eucalyptus and palm trees. Jake said, "Loquat need shade from about 12 on all the thriving ones I see are in a situations like that . Ours has 70 percent shade while its young . 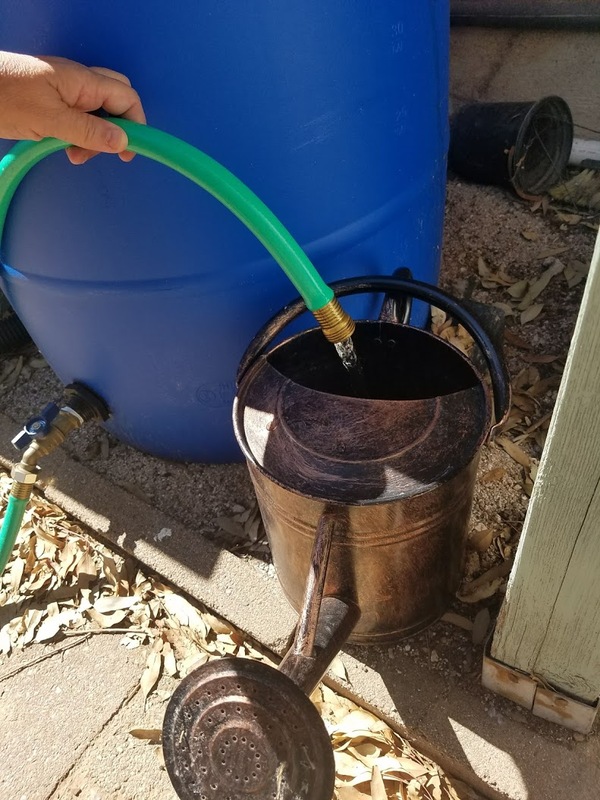 Also deep water once or twice a week for 2 hours, slow drip to promote root growth downward, the water will reach about 2-3 feet doing that and last much longer once tree is established . Watering daily causes the roots to never go deep and they will expire if you forget a day of watering.